The Fox, Raccoon and Beaver are modified Mini Bears. 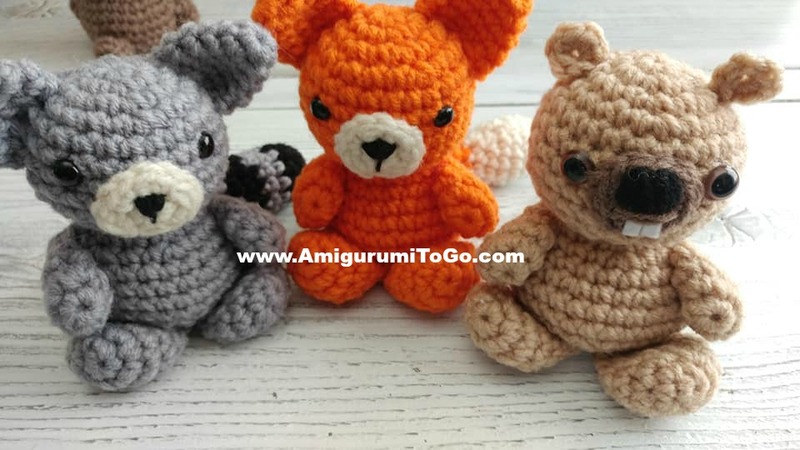 I just released the bear pattern last week, here, along with video tutorials for each part of the bear pattern. 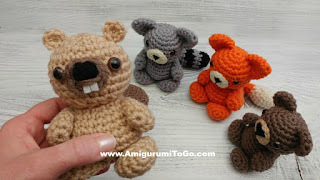 If you need help with making a Forest Friend you can follow the same videos that show you how to make the muzzle, the head and body, the arms and legs and how to sew it all together. The only parts that are different from the bear are the ears and tails. How to read the rows: Mark off the last st of row 2 and move that marker at the end of each row. Each row has a sequence. Example: 1sc then 2sc in next st means repeat that sequence 1sc then 2sc in next st followed by 1sc then 2sc in next st over and over to the end of that particular row. The number inside the parentheses ( ~ ) is the number of stitches you should have at the end of that particular row. Whip stitch a nose in place then set the muzzle aside until we're ready to sew it on. 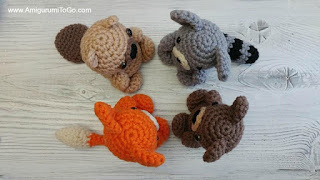 The Beaver has a larger nose than the others. Add 2 pieces of white felt for the beaver's teeth. You can glue or sew these on. 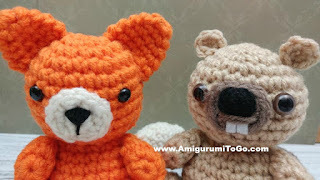 After I glued the teeth on the beaver snout I wrapped yarn over the tops of them (see picture). You can do the same or leave the teeth by themselves. Install the eyes on each side of the muzzle in between the 6th and 7th row.If you're following the bear video, the eyes are closer together than I did for the fox and raccoon. You place them where you wish. stuff. 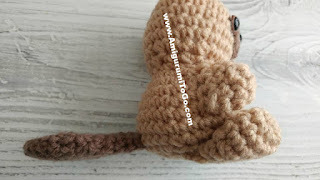 This is the only part of the tail that gets stuffed. sl st next st and f/o leaving tail for sewing. Do not stuff. Stretch out and flatten the tail. 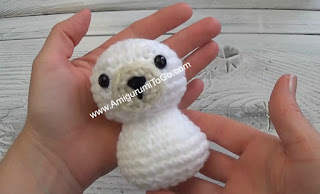 If feeling unsure about the assembly please watch the video here It is the bear assembly video but the sewing is the same. 3) Sew the arms on. Refer to picture in step 1 or the assembly video. 4) Pin the ears in place if need be. 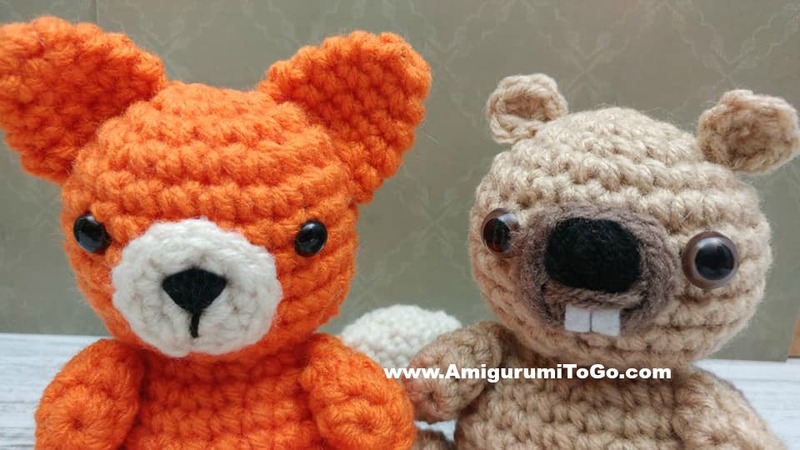 The beaver's ears are sewn in between the 3rd and 4th row. 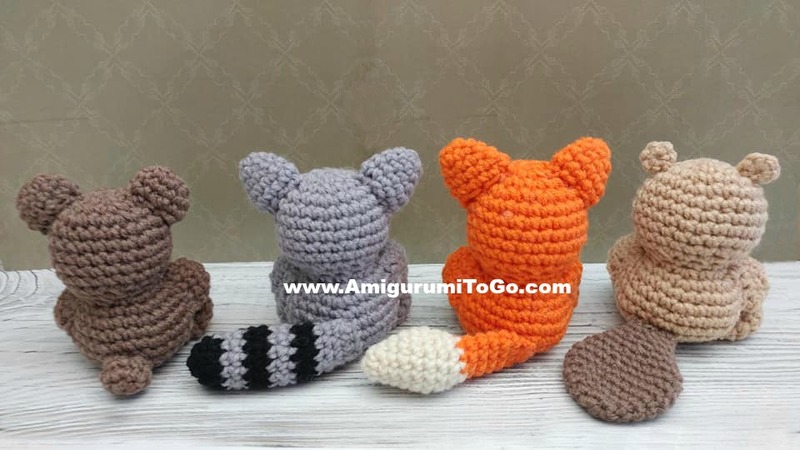 The top corner of the bear, fox and raccoon ears are sewn in between the 2nd and 3rd row. You're done! I hope you enjoyed making your own mini Forest Friends.